My very first Julep Maven Box arrived today! Earlier I posted about the 1¢ promotion that Julep is running now to new members. Click Here to view that blog post. For only 1¢ I simply could not resist trying it out! I chose the It Girl Introductory Box. The profile poll on Julep's site suggested it to me and when I looked at the others, It Girl was the only one that came with 3 polishes instead of 2 polishes and a hand care product. The packaging was very cute. And, who can't use another nail file? Between the 2 photos above, Heather changes the most when the lighting changes. The consistency of the polish seems great and I can't wait to try these out! 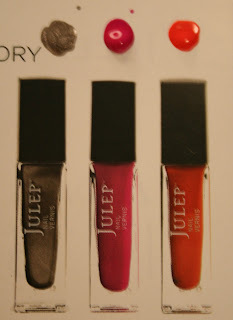 Have you tried Julep polishes or their Maven program? 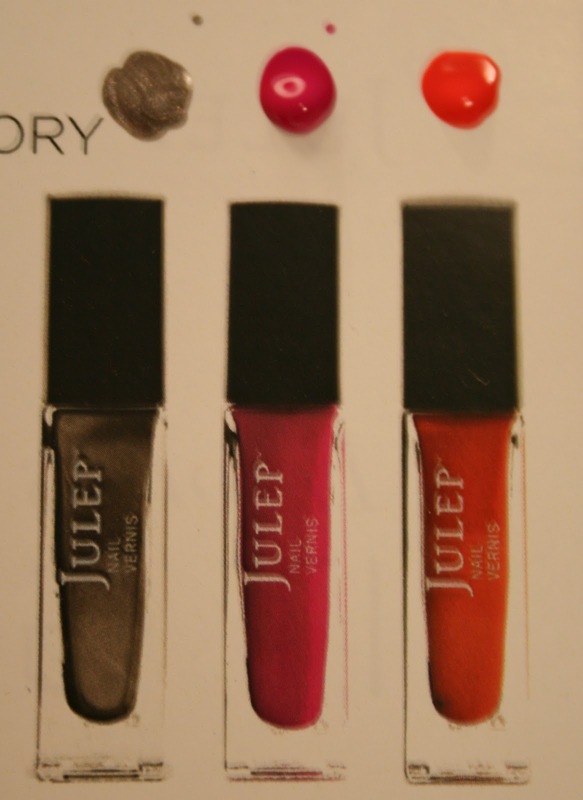 Do you have a favorite Julep polish? If you want to try the Julep Maven Box the promo is still running. First time members can get their first box for only 1¢ and you can cancel anytime. Click Here and enter COLORS4ONE at checkout. The link does give me credit toward a future free box. Part of their program is that you get a free box for every 2 friends you refer. So, when you sign up you will get your own link, too. If you don't want to follow that link you can still go to Julep.com and enter the code above at checkout for the same discount :) And, Julep Maven members get a 20% discount on all Julep.com purchases and free shipping. I didn't find how to get the promo you talk about though! Too bad! Just follow the link, click on "Julep Maven" on the top, take the quiz, create an account, choose your fist box (mine is "it girl" but there are others to choose from) add your box to your cart and when you check out, enter COLORS4ONE in the promo/discount field and complete your check out :) the total will be 1¢ with free shipping :) Hope that helps!